Last night I hosted my first House Party! I hosted a Barilla Piccolini Party. First, sign up at the House Party website! Choose an upcoming party that you would like to host and apply for it. The application asks you questions about your familiarity with the product that will be featured at your party (I don’t think you have to have tried the product before to be able to host a party). It will also ask a few questions about your personality and how frequently you have parties. The application only takes a few minutes and is very easy. Once you submit the application you will receive a confirmation email. You must click the link in the email to confirm your email address. Then you just wait for an email from them saying whether or not you were selected to host the party. If you weren’t picked then just go sign up for another one! If you were picked, congratulations! After being selected for a party you will have to make a party page. There will be a link to your page in the email from House Party. You will invite your guests from the page, upload pics, and write in your blog. House Party will send you emails with updates up until party day. About a week or so before the party you will receive a party package. The package will contain anything from coupons to products to party favors depending on the particular house party you are hosting. For my Barilla Piccolini House Party, I received: (2) Boxes of Barilla Piccolini Mini Farfalle, a package of (cute!!) 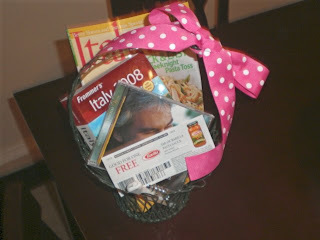 wine glass charms, an Italian music CD, an Italy book, an Italian magazine, a wine bottle opener, (8) stess balls with the Barilla logo, (8) mini Barilla timers, (8) Cooking with Kids booklets, (8) recipe cards, (8) $1/2 Barilla Sauce coupons, and (2) Free Barilla Sauce Coupons. So, there was a lot of great stuff in there! You can plan your party any way you want! You pick the food (obviously if it’s featuring a food item you would want to incorporate that food), the guests, the time, place, everything! No one from house party comes to your home or calls or anything. In fact there is no real way for them to know if you actually had a party. It is all on an honor system. I don’t know why anyone wouldn’t want to have a party though, it was so much fun! You get to have a party AND you get lots of free stuff to share with your friends! I put everyone’s name in a bowl and the winner got to take this home along with the one of the gift bags I made with the Barilla party favors. The winner happened to be my good friend Rachel from Surviving the Stores! I had a blast and got to try some delicious pasta for free! I have to say, I am now a huge fan of House Party and can’t wait to host my next party! So, go sign up at House Party and apply for your first party!